What is Lottery+? Lottery+ is a simple and powerful lottery plugin that makes lotteries easy to make and fun to play! Why should you choose my plugin verses others? Other plugins tend to limit you on options and your lotteries, whereas mine possesses limitless options! For instance these lotteries can have extensive options such as Towny support, Item economies, Item rewards, ect... To get started, follow my step-by-step tutorial. Hope you enjoy it! Supports limitless lotteries with dozens options! The world is your oyster! Supports Vault so you can tap into you server's local economy. 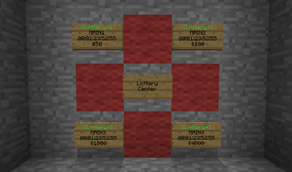 You can attach a sign to a lottery so your users can use those instead of commands. Supports NuVotifier so you can rewards users for voting for your server. Want to do more than just have a pot on your lottery? You can also add all sorts of item rewards and you can even add a 'command reward' that dispatches through the console so that covers a lot of bases. Worried about players forgetting about lotteries? No problem. You can set in the config to remind players about them. How do I start creating lotteries? You can start creating them by following my thorough step-by-step tutorial. There are also some videos you can watch. Are lotteries saved after my server reloads or stops? Yes. Lottery+ is constantly saving it's lotteries to ensure they are up to date. Do I need to install any plugins for Lottery+? No, you do not need any plugins. It is recommended that you have Vault if you want to use your server's economy. Lottery+ also supports Towny and Votifier. Is there a way to edit the messages? Yes. If look for a file called 'lang.properties', you can edit the messages in their. Before reporting an error, please consider doing a complete reinstallation. If you have done this, please consider writing a ticket. Be sure to add your config.yml and lotteries.yml when writing your ticket (using pastebin is fine as well). Remember, the more bugs I squash, the better the plugin becomes! Maybe a system that updates the 'lang.properties'? Some more types of rewards? Have any feature requests? Please don't hesitate to share your ideas!